Brief Synopsis – During the depression, a down on his luck musician tries to find a job playing in a famous orchestra. My Take on it – This is another film on this list of Best Picture Nominees that I had never heard of before but was solely intrigued by the title which seems so odd. Once you watch the film, you will have a better understanding as to how appropriate a title it truly is. 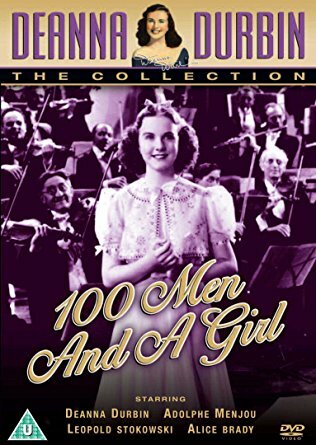 The cast is great with Deanna Durbin and Adolph Menjou both giving great performances as a father and his daughter who are trying to find work in the music field during the Depression to little avail. They do a wonderful job portraying how difficult life was for people like them during those tough times even on ordinary people. I admit that this film might be a bit too upbeat for such a theme, but in retrospect, it makes sense since it is also trying to portray hope in such situations. The story itself flows well and is helped along by some great musical scenes which shows how beautiful the love of music can be even when you are in despair. This isn’t a film that would be deserving of winning the award for Best Picture, but I can understand its nomination at such a critical time. Bottom Line – Great look at the troubles of the Depression on ordinary men. Yes, this film shows lots of hope especially when it seems lost, but still works. The story works really well the whole way through and keeps things interesting. Great cast led by Durbin and Menjou. Has some great musical numbers that show how beautiful music can really be. Recommended!